For nearly two decades, this pressure-washed-to-hell beige building in a strip mall off North Point Parkway in Alpharetta, GA has been one of my favorite places. 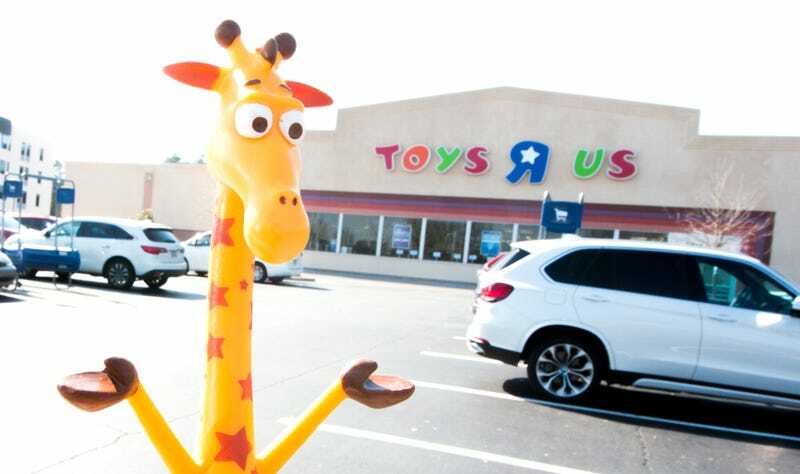 Soon it will close its doors for good, along with the other 734 Toys ‘R’ Us locations across the United States. So I gathered up one of my children and took one final ride through the aisles. Store number 8847 wasn’t on the list of 182 locations Toys ‘R’ Us announced were closing back in January, so I was hopeful it might weather the company’s ongoing bankruptcy proceedings. But last night’s filing and subsequent announcement that the retailer was beginning the process of winding down its U.S. operations snuffed that hope. At first glance the North Point store certainly doesn’t look like a retailer on the verge of closing. The entrance area is festooned with pre-stuffed Easter baskets and other sugary resurrection-themed treats. But the feeling of impending doom is everywhere. Unfamiliar employees huddle near the registers, talking quietly among themselves. No one smiles or greets us. For the first time in years of visiting the location, not a single employee asks us if we need any help. I want to ask them if they do. Looking closer at the shelves, holes begin to show. The Lego area, my home away from home, is normally completely filled with box after box of plastic brick kits. Now some shelves lay completely bare, while others have their boxes spaced out wider than normal, attempting to fill the same space with fewer toys. Other aisles are noticeably compressed. Hasbro’s My Little Pony: Friendship is Magic had nearly an entire four wall-panel aisle to itself a few weeks back. Now it’s squeezed into half that area. Not that I’ve been paying attention or anything. The Transformers section of the store, across the great boy/girl divide Toys ‘R’ Us has maintained for decades, is just as sad. There are no clearance signs or massive sales going on. This is just what they’ve got left. It’s more depressing the more we wander. There aren’t a lot of customers about at 3:30 p.m. on a weekday. The ones we do run into either seem glum or unaware of the situation. There’s a silver-haired man wearing a neat maroon polo shirt and creased khakis, going from aisle to aisle, snapping pictures with his phone. Maybe he’s another long-time customer taking a final tour. “Boys toys” to the left, “girls toys” to the right. We’re going down the middle. “Why is it for girls?” I ask. “Because it’s all stuff for girls,” he replies confidently. “I don’t believe that’s true,” I say, but he’s attention is caught by something in the Disney aisle. It’s a musical jewelry box featuring Tamatoa, the monster crab from Moana. Press a button on the front and he sings an excerpt from “Shiny” in the voice of Jermaine Clement. Seamus presses the button over and over again for two minutes. “So you like that?” I ask. “Yes,” he replies, pressing the button for the umpteenth time. “Even though it’s from the girls aisle?” He ignores me. Still a “girls’ toy,” but it has a button. A broken button that no one’s going to bother fixing. But not for long. He wants to play in the world’s second saddest ball pit. “No, you really don’t,” I say. He wants to sleep in the Batman bed. “You don’t even sleep in your own bed,” I reply. He wants to tell me, as matter-of-factly as possible, that he does not care about Pokemon. I do not throw him out of the cart. It would hurt my back. He does, however, care about Pop! Vinyls, Funko’s samey, collectible, licensed figure line that’s been wreaking havoc on traditional toy sales for the past couple of years. The display is front-and-center at the North Point Toys ‘R’ Us, conveniently across from the cash registers, in case anyone needs a Xavier Woods or a Yellow Ranger. I already have a Xavier Woods, but only because he’s great. At least Seamus knows who Geoffrey is. I’m proud of Seamus for knowing that fact, even if he probably learned it while watching stuff he’s not supposed to on YouTube. He might be one of the last wave of American children who will. After circling the store four or five times, we wind up at the cashier. We get Geoffrey, Tamatoa, a little Roblox toy for Seamus’ twin brother Archer, and a book called Lego Batman’s Guide To Being Cool, which Seamus insisted was a much better choice than the Pokemon encyclopedia I offered him earlier in our rounds. I pull out my credit card toy. “Oh, do you need my Rewards Club membership number?” I ask. The cashier shrugs. “Oh, I guess that doesn’t matter anymore,” I say. “No, not really,” he replies. I finish paying and walk out those dingy automatic doors one last time. “Are you going to miss Toys ‘R’ Us?” I ask Seamus while stuck in traffic on the way home.